Each year, I swoon with delight at the scene in my backyard. After a long winter with bare branches, the tree in the backyard puts out tiny buds of a delicate green. 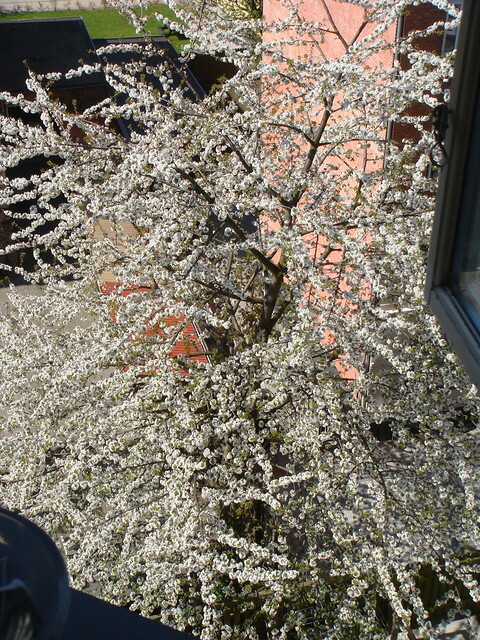 If the sun is out and the temperature is warm, the tree fast-forwards to an explosion of white blossoms. No green is visible, just the white blossoms. I have never learned the name of the tree, and I have never tried to look it up. I don’t need to know its name because I know its beauty. Corny, but true. Perhaps my delight comes from knowing the winter coats and boots can truly be packed away for a season. Or knowing that the days are longer with more sunlight to give energy to so many ideas and activities. It’s definitely a sign that this bear is coming out of hibernation. When the blossoms disappear, I settle in for a summer viewing of green. When the leaves disappear, I know the blossoms are only a few dark months away. Sometimes, those dark months drag on, but the blossoms always erase those memories and the cycle starts again. My favorite tree is outside the back door; its blossoms are pink and won’t show up for a couple weeks. But those momentary delights mean to me what they seem to mean to you. You just explain it better. Thank you. Thanks for stopping by, Ken, and thank you for your comments. Momentary delights is also a very, very good way of phrasing it.